If you want music to be a part of your life, then you have to be dedicated. Dedicated to practicing, dedicated to hustling, dedicated to promoting, dedicated to the dream. It’s not something that happens overnight. Jason Lamson knows this well and is dedicated to all of those things — except the promotion aspect sometimes gets away from him. He thinks he would be a lot further than where he is right now if he could just be better at advertising himself. While he’s figuring that out, he stays busy practicing. As we chat over a couple of beers at Willie T’s at 525 Duval St. (one of the venues where he performs), it’s immediately clear that Lamson genuinely loves what he does. Even though he didn’t even teach himself the guitar until the late age of 17, he still learned enough to do a few shows in his hometown of Richmond Hill, Ga., and at frat parties and open mic appearances once he went to college. At one point, he took a break from playing for a couple of years so he could focus on a degree in construction management. Seven days after graduating he was hired as a construction supervisor and started working 10-12-hour days. The demanding routine was all he needed to find his way back to music. He slowly started doing one or two shows a week in Savannah while trying to maintain an early morning schedule, soon finding out that he only had enough time to be dedicated to one thing. He chose music. While still in Savannah, he signed a five-page contract to be the fulltime head of entertainment and house musician at the Green Room (corner of Duval and Greene streets). Soon after signing the papers he and his girlfriend-now-wife, Jordan, packed up a U-Haul and headed south. When they arrived in Key West, they found squatters at the house they were meant to rent. For a month, the couple and their dog slept on a mattress in what is now the office at the Green Room. Lamson stayed at the Green Room for a year before deciding to explore other venues around town. 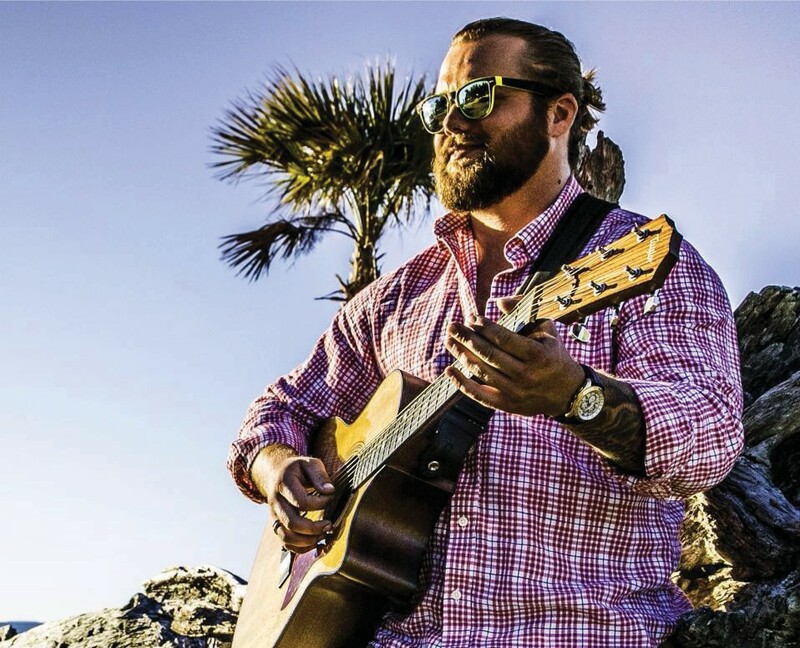 He still does one show a week there but also plays at Willie T’s (2:30 p.m. Monday and Saturday and 11 a.m. Tuesday), at Sunset Tiki Bar (6 p.m. Thursday) and poolside at the Southernmost Hotel Shores (noon Friday). Whenever he can he also makes the occasional guest appearance at Island Dogs, Margaritaville, Sunset Pier and the Green Parrot. I first met Lamson when I was fostering a little wire-haired dog named Willis. I was on a random walk around town with Willis and just happened to make a quick pit stop at the Porch on Caroline Street. Lamson and Jordan were there, and we got into talking about rescue dogs and how they were actively looking to adopt. They weren’t planning on meeting Willis that day and falling in love with him on the spot. The next day he was at their house. “It’s all about giving yourself second chances,” Lamson says. As we finish our beers I ask what else he does besides music. He goes quiet for a minute because he doesn’t know what to say. It’s all about music for him. When he’s not playing a show, he’s at home learning theory and writing songs. With all that dedication, I’m sure that when he’s ready he’ll get to where he needs to be. In the meantime, Key West local and visitors alike are free to enjoy his soulful, Southern homegrown sound and his natural sense of rhythm. “Music brings a lot of people together who might not normally get to be together,” he says. “It gives people something to do besides just going to a bar to drink. Sometimes, it’s all about going to see good music.